It was a chaotic day for parents who juggled with schedules to ferry their children to school following the total strike by private school buses today. Things , however, are expected to be improve on Tuesday as a sizeable number of buses will be back on the roads. 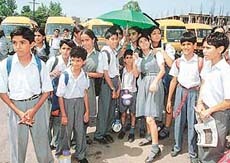 Children wait for their parents to pick them up as buses remain parked in the background in Chandigarh on Monday. It is a matter of how two sides look at the crisis created by the ongoing strike by the school bus operators. On one side are the children, and on the other side are parents or guardians, who have to drop and pick the kids from school by juggling their already packed schedules. Petty politicking in the Punjab University, prior to the elections of the Campus Students Council, once again came to the fore with the attack on the newly elected Chairman of the Haryana Students Association (HSA), Mr Amit Rana, by the supporters of the dethroned chairman, Mr Chand Singh Madan, and the retaliatory action by the latter. The long overdue election to the post of president and vice-president of the Municipal Committee was postponed sine die yet again, here today, with members failing to turn up for the scheduled meeting. Its true. Candidates with the UGC qualifications and good marks in postgraduation prefer to apply for job as lecturer in a college and not join as schoolteachers. Taking serious note of the delayed possession of the dwelling units in Sector 38 (West) by the Chandigarh Housing Board (CHB), the District Consumer Disputes Redressal Forum-II has issued notice to the board for October 16. In less than three days after a school teacher allegedly asked the entire class slaps four classmates for reportedly annoying her, the Director Public Instructions for Schools, Mr D.S. Saroya, today ordered the “withdrawal of the tutor from the school with immediate effect”. The DPI also directed the setting up of a committee of two senior officers to look into the matter. A delegation of Municipal Corporation of Vishakapatnam (MCV), including the Deputy Mayor, Mr M. Appala Raju, and floor leaders of the Congress, Bharatiya Janata Party (BJP) and Telugu Desam Party ( TDP), Mr P.L.N. Patnaik, Mr H. Apparao Reddy and Mr P.G.K. Varma respectively, today visited the MC office here and met the Mayor, the Commissioner, officers and councillors. The Mayor, Ms Harjinder Kaur, presents a memento to Mr M. Appala Raju, Deputy Mayor of the Municipal Corporation of Vishakapatnam, in the assembly hall of the MC in Chandigarh on Monday. The Union Information and Broadcasting Minister, Ms Sushma Swaraj, inaugurated two low power transmitters (LPTs) to telecast Doordarshan (I) and Doordarshan (II) programmes from the Doordarshan kendra in Sector 37 here today. 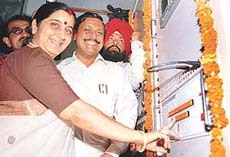 Ms Sushma Swaraj, Union Minister for Information and Broadcasting, inaugurates low power transmitter (LPT) of Doordarshan at Sector 37 in Chandigarh on Monday. The “sound” financial health of the local civic body is proving to be a hurdle in its efforts to get funds from the Infrastructure Development Fund. An amount of Rs 50 crore was recently released by the Punjab Government for development works in various civic bodies in the state. The ‘‘defence sector’’ of the city — Sector 36 — continues to be plauged by problems as the authorities concerned look the other way. The water supply scheme of Kharar involves an investment of about Rs 1 crore and a recurring expense of about Rs 3 lakh a month, and still the residents are not getting adequate supply of drinking water. Erratic supply of electricity and unscheduled power-cuts aggravate the situation further. The members of the Bhartiya Kisan Union, led by its district president, Mr Shamsher Singh Gharuan, sat in dharna for more than three hours in 132 kv station, Bhagu Majra (Kharar), today to protest against the erratic supply of electricity to the residents of villages for the past many days and failure on the part of the employees of the PSEB in solving various complaints of the villagers. In a bid to unite the faction-ridden local unit of the SAD, Mr Sukhdev Singh Dhindsa, Union Minister and General Secretary of the SAD, called the meeting of the two factions here today. Mr Kiranbir Singh Kang, senior vice-president, Shiromani Youth Akali Dal, and one of the aspirants for the SAD ticket from the Kharar Assembly constituency, yesterday urged the Punjab Government to immediately order the repair of 13 prominent roads of Kharar areas the people of this area were facing a lot of problems. Mr Satya Pal Jain, a former MP of Chandigarh, today inaugurated the second block and the first floor of the Veterinary Hospital Building of Chandigarh run by the society for Prevention of Cruelty to Animals in Sector 38. A passion to decorate her home has turned her into an artefacts dealer. A former model of Eve’s Weekly and wife of a Naval officer, Mrs Nirmal Nagra travels throughout the country to select artefacts. Besides this, she is a familiar name in gardening and landscaping. The Sector 46 -D Residents Welfare Forum (Kothies) today organised a welcome function for the new Mayor of Chandigarh, Ms Harjinder Kaur. The national president of the Samata Party , Mr VV Krishna Rao, today stressed the need for setting up a children’s society to make children aware of their rights. The Jeevan Bima Welfare Cultural Society today held a tree plantation function in its colony. The local police has arrested 13 persons from different places in Sector 39 on the charge of gambling at a public places. A sum of Rs 1,330 and four packs of cards were seized from them. Despite some aggressive hardsell by the Punjab Government to project SAS Nagar as an up-and-coming electronic city and the next IT destination, Chandigarh remains a preferred IT destination for the investors. 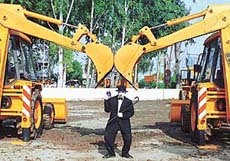 A ‘Balle-balle show’ with EJCB Machines, was organised, perhaps for the first time in North India, by Escorts JCB Limited, manufacturers of earthmovers and construction equipment at Daulat Singhwala village on the Chandigarh-Ambala highway. Quashing an order treating the suspension period of an employee as leave, Mr Justice Mehtab Singh Gill of the High Court today directed Uttar Haryana Bijli Vitran Nigam and another respondent to count the same as duty period “for all intents and purposes”. Issuing notice of motion for October 15 on a petition filed by Sector 26 St Kabir School, challenging the move of the Chandigarh Administration to shift the Sector 21 scooter market and other mechanics right opposite their gate, a Division Bench of the Punjab and Haryana High Court today ordered the maintenance of status quo regarding construction. The UT Consumer Disputes Redressal Commission has dismissed the appeal filed by the Punjab Refrigerator against the order passed by the Consumer Forum — II. Sanjay Kumar and other two persons allegedly involved in an unsuccessful robbery attempt at a house in Sector 35 were again sent to police remand by a local court till September 6 here today. Lifetime opportunities simply happen to some people. One such chance also fell into the lap of seven-year-old Sunirmit Verma, who is today exhibiting his pencil, crayon and pastel drawings in the art gallery of Punjab Kala Bhavan in Sector 16. More than 16 teams from different areas in the city, which included preraks, nodal preraks and learners, participated in folk dance competition as part of the celebrations of the international literacy fortnight from August 27 to September 7, at the Female Literacy House, Sector 42. As part of Samskritik Varsha celebrations, the Chandigarh chapter of the Bharat Vikas Parishad organised a seminar on “Cultural Pollution : A Threat to India’s Order,” at Gandhi Smarak Bhavan in Sector 16 here today. Rajendra Gangani, termed as the torch-bearer of the Jaipur school of kathak, is coming to Chandigarh to hold a kathak workshop. Kanwar Iqbal, a city-based music director, has bagged this year’s the best music director award on the occasion of 21st death anniversary of Mohammad Rafi, observed in Amritsar yesterday. The PGI Standing Purchase Committee (SPC) today approved the latest state-of- -the- art equipment worth Rs 15 crore for the upcoming Advanced Eye Centre, Advanced Cardiac Centre, second phase of the Advanced Paediatric Centre and the Trauma Centre in the institute. Eight operation theatres on the fifth floor of the PGI were closed once again today, this time for maintenance work on duct pipes of the airconditioning system in the complex. A three-week course on “Inspection of pharmaceutical Facilities” began at the National Institute of Pharmaceutical Education and Research (NIPER) here today. As many as 10 persons from pharmacy boards, drug quality control authorities and inspecting departments of 10 different countries are attending the course. As many as 20 persons donated blood in a ‘‘Voluntary blood donation Camp’’ organised by Haryana Raj Bhavan in collaboration with the Transfusion of Medicine Department of the PGI and the Blood Bank Society, Chandigarh, here today. The Sector 42 office of the Sports Authority of India requires regular services of a regional director and some expansion to make this centre a full-fledged regional office equipped with the necessary infrastructure to boost sports in the region. It would instil a sense of confidence among coaches, sportspersons of the area. Kabir Dhaliwal gave a consistent display in the inaugural Monsoon Fun Golf Competitions organised by the Chandigarh Golf Association at the floodlit CGA Driving Range on Saturday night. Kabir logged maximum points, finishing first in the longest drive andthe runner-up in chipping competition. He was awarded Jet Airways to and fro ticket for two from Chandigarh to Delhi. Shivalik Public school, Sector 41, won the ‘pride of honour’ when its both boys and girls’ teams captured the titles in the 7th Chandigarh Sub-Junior State Ball Badminton Championships, which concluded here this evening at Shivalik Public School, Sector 41. In the boys’ final, SPS-41 outplayed Guru Harkishan Public School, Sector 40, 29-18, 29-12, while third place in this section went to Government High School, Sector 41, who defeated Manav Mangal school, Sector 21, 29-24, 29-21. A multi-point video conferencing facility which enables officials to hold a conference using video facility through computers was inaugurated today by the UT Administrator, Lieut-Gen J.F.R. Jacob (retd).